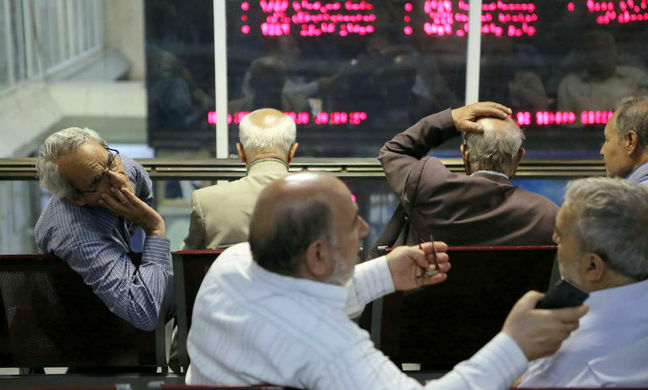 EghtesadOnline: Uncertainties caused Tehran stocks to pull the brakes last week on a rally that lasted for most of the month and boosted shares to new highs. In fact, the trading week that ended on August 15 only had volatility and ambiguity to offer investors, as the rollercoaster trading had stocks ending about where they started. Tehran Stock Exchange's all-share index, TEDPIX, lost 1,045 points or 0.8% during the week that ended on August 15 to close at 130,476.9. Iran Fara Bourse’s benchmark index, IFX, inched up 1.2 points or 0.1% to stand at 1,500.8, according to Financial Tribune. What got bullish investors wobbly last week was primarily the double-whammy of government-enforced pricing schemes at Iran Mercantile Exchange and base metals' global price fluctuations caused by the all-out trade war between the United States and China, Donya-e-Bourse reported. On the local front, investors are decrying the government's decision to keep offering metal and petrochemical products at IME using the 42,000-rial to US dollar exchange rate, even though officials have long backtracked on the policy in the currency market by expanding the Secondary Forex Market. This, coupled with the fact that petrochemical producers are still not sure of feedstock prices, has made investors unwary. As for the global markets, base metal prices staged a meltdown primarily starring copper, aluminum, lead and zincm and even caused trouble to seep over into the oil market. The US-China tariff war is still ongoing, and the upticks in USD index plus the recent Turkey currency crisis are not helping the situation. Analysts believe that the commodity market's sour mood will persist in the short run and Tehran investors might have to buckle up. And as stocks slow down, their nemesis rears its head. Bond yields have grown to new heights in recent months with interest on two-year debt instruments hitting 30%. Not only it's an historical high, but it is way beyond what the money market can offer investors as bank deposit returns are capped at 15%. Stocks are all the rage for the time being, but if they leave the spotlight, bonds will be ready to take their place with attractive yields. Over 8.23 billion shares valued at $283.53 million were traded on TSE last week. The number of traded shares and trade value dropped by 36% and 47% compared to the week before respectively. TSE’s First Market Index lost 501 points or 0.5% to end at 95,269.6. The Second Market Index decreased by 3,364 points or 1.26% to close at 267,937.4. TSE Free Float Index lost 1,278 points or 0.9% to settle at 6,489.7. TSE top 30 and top 50 lost 118 (1.8%) and 58 (1%) respectively, closing at 6,489.7 and 5,698.8. At IFB, over 3.07 billion securities valued at $364 million were traded, with the number of traded shares decreasing by 24% and trade value increasing by 28% compared to the previous week respectively. IFB’s market cap also gained $7.5 million to reach $19.56 billion. Its First Market witnessed the trading of 744 million securities valued at $20.37 million. About 1,268 million securities valued at $49.50 million were traded in the Second Market. Over 26 million debt securities valued at $266.23 million were also traded at IFB, showing an increase of 68% in volume and an 88% increase in value. Trading by exchange-traded funds reached 37 million worth $7.22 million, registering a decrease of 58% in volume and a 55% downturn in value. Housing mortgage rights also registered a decline of 10% in both volume and value, as their trade reached 430,000 shares worth $3.24 million.